Although I’ve trained in a few different arts, it is karate that remains my central passion. I love the art of karate and I am a great believer in it. However, I believe that we do the art a great disservice if we deny it has any faults and take the view that the art has reached a state of perfection. A few months ago (Nov 2009) I put out a podcast via my website called “Karate’s three biggest mistakes”. The idea was to point out what I felt were common mistakes in much of karate practise in the hope of stimulating discussion. Although the podcast was produced from the perspective of someone who loves the art of karate and wants to see it thrive, I felt sure that by daring to point out that the art was not perfect that I was sure to be branded a “heretic” by some of karate’s more dogmatic practitioners. However, I was completely wrong! The podcast received more downloads and feedback than any other we have done and all of it was in agreement and felt it was a positive thing that these errors had been articulated. I’d like to articulate these same errors for readers of this article in the hope that they also find value in airing what I feel are the three most common, and yet frequently unseen, mistakes in karate. Personally, I’d rather put forward solutions and suggest how things could be made better. However, people will only be interested in potential solutions if they are aware there is a problem in the first place. I hope you’ll forgive me for being a little “negative” and that you appreciate that my purpose in pointing out these errors is to encourage us to think of positive solutions and to help ensure that both the art of karate and its practitioners can reach their maximum potential. In the martial arts we often have discussions on what works and what does not. The trouble is that the question, “Does this work?” is completely meaningless without first establishing the context. Do we mean will this work in the dojo? Will this work in a boxing match? A karate tournament? In self-defence? In a cage fight? Unless we know the context, we can’t answer the question of “Does this work?” in a meaningful way. The problem we have is that, in my experience, the majority of karateka fail to differentiate between environments and the reason they do this is because they are not aware there is any difference. Everything gets lumped together and training methods, concepts and techniques that work well in one environment are inadvertently transposed to another environment in which they don’t work. To help make things clearer let’s take a couple of techniques and see how their effectiveness changes as we change environment. For starters, let’s take a controlled head height hook kick. Does this work? In a karate tournament, yes it does. It works great! But will it work in any other environment? In boxing it would get you knocked out or disqualified. In MMA the fact the kick was controlled would make it pointless as you would achieve nothing and would open yourself up to being countered. In self-defence you rarely have the room to kick and such a risky method that won’t yield any results is to be highly discouraged. So the technique will work superbly well in one environment, but is pointless or dangerous in the others. What about deliberately taking the fight to the ground with a skilled takedown? It would get you disqualified in boxing and karate competitions. In self-defence it would leave you vulnerable to getting kicked or stabbed by the acquaintances of the person taken to the floor; even if you were winning the ground fight with the person taken down. In MMA though, a dynamic and well executed takedown could put you in a very advantageous position and would be very popular with both judges and the audience. What about techniques for disengagement so we can run away. Such methods are vitally important for self-defence, but running off the mat or out of the ring or cage is not going to lead to success in other environments. We could go on with this ad infinitum, but I hope I have made it clear that defining the environment is vitally important when it comes to determining “what works”. It is therefore a major problem when people fail to define the environment. Most karate people simply turn up and practise “karate”, they never identify all the subcategorises of their practise. The result is the students fail to identify what will lead to success in any given environment. This can be disastrous! In my own dojo, I always identify what environment we are training for in any given moment. My students know when they are training for self-defence, fighting (and if you think that is the same as self-defence then you are also failing to differentiate between environments), attribute training and fun. And if we did any competition, which we don’t, they would be clear when they were training for that too. A big contributor to this problem is people over valuing the crossover between environments. This leads to things merging and again this leads to confusion. In common dojo sparring, we move around looking for and creating openings, apply our techniques and then move out so the process can begin again. Even if we do this full contact, it is “fighting” with one person and is still nothing like what is required for self-defence should a situation degenerate into physical conflict. True, there will be some cross over but it will only ever be a small cross over and we should ensure that our training is 100% relevant to the environment we are training for, rather than being 5% relevant by default. One of the great things about always being 100% relevant and 100% focused on a given environment is that it means we avoid the temptation to cram everything into one box in order to justify practise. When we train the self-protection side of what we do, we are 100% focused on it and everything we do is 100% relevant. 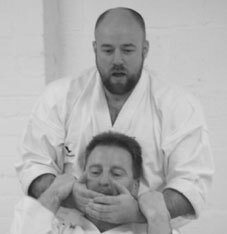 However, when we practise things like complex ankle locks and advanced kicking we know this is not relevant to self-protection and it is something we are doing entirely for the fun of it. There is no need to create a false link to self-protection in order to justify the practise of such techniques. We do them because they are interesting and fun to play with. The students know we do such things for fun and not for self-protection. We differentiate between environments so that we train in a focused manner, so that the students are never confused, and we also free ourselves to have fun with other elements of our martial arts too. I’d strongly encourage you to differentiate between environments and not lump all of karate together into one homogonous unfocused mass. We can do it all, but we should always be 100% sure what environment we are training for in any given instance. Training for an unfocused “all” all the time is a recipe for disaster as we fail to identify what will be successful in the various environments we may train for. The second mistake is related to the first. When we are unclear on what environment we are training for, we also fail to clearly identify what will lead to success in those environments. Things get confused and the goal of training gets lost. This often leads to the introduction of artificial success criteria. True success criteria is always directly linked to the environment we are training for. If we are training for competition then the success criteria is winning tournaments. The training should therefore be conducted with that aim in mind and “success” will be determined by whether we win or not. When we are training for self-protection, the success criteria will be avoidance of dangerous situations in the first instance, disengaging and escaping from dangerous situations in the second instance, and quickly incapacitating the enemy or enemies if any of the previous proves impossible. Training should be conducted with these goals in mind and success determined by our ability to achieve these goals. The problem we have in karate these days is that we have taken our eye off the ball and introduced artificial success criteria that frequently run contrary to our goals (and as we discussed these goals are often either not set or are unfocused). A punch is fundamentally designed to damage other human beings so that they can no longer function. A punch should therefore be judged by the success criteria of its ability to incapacitate. We should train our punches with that goal in mind such that our training increases the ability of our punches to incapacitate. A punch should be deemed “good” if it can damage people. However, in karate these days we rarely use this functional success criteria and instead have introduced artificial success criteria such as what a punch looks like or how closely it conforms to the arbitrary dictates of a given “style”. We therefore don’t train for powerful punches that can damage others, we train to produce punches that look nice and tick all the boxes of our style. These artificial criteria tend to take precedence and hence we no longer measure by effect. Now I know that some people reading this will think that by stating that we should be measuring by effect that I’m endorsing sloppy technique. Are you one of them? If you are then you have to ask yourself why you associate effective with sloppy? Surely if the criteria of your style is correct, it would coincide with what is also highly effective? If you do think “effective” is “sloppy”, I would say that it is because in your heart of hearts you know that what you define as “good technique” is ineffective. As I say, sometimes when I say we should measure by effect, people wrongly assume that the “functional technique” I am endorsing is clumsy or crude (i.e. just a big muscular swing of a fist) and hence inferior to a highly refined and aesthetic martial arts technique. That’s one million miles away from the truth in my view as a technique should be simultaneously highly refined, aesthetic and functional. We can, and should, be measuring by effect and relentlessly working to increase that effect. The end result will be a highly polished technique – which will be pleasing to the eye – that is highly functional. The technique is good because it works incredibly well. We don’t define “good” by a set of criteria which may or may not be linked to functionality. We need to return to measure everything by effect. The more effective it is, the better it is. Sure it will look good and it may well be inline with the criteria set by your group or style (if the group or style also measures by effect). But these are secondary considerations and functionality must always be what we pursue as the primary goal. To do anything else will lead to a reduction in functionality as we will be putting the cart before the horse. I’d just like to conclude this section by pointing out that “effectiveness” is always determined by the environment and hence this mistake is linked to the first. And both are linked to the third mistake of modern karate which we shall now discuss. If we have successfully defined the environment and are training to ensure success within that environment, we are well on our way to getting the most out of our training. However, there is one more trap that I see many karateka falling into. And that is failing to judge their personal training by their personal results. In recent times the MMA world has been incredibly impressed by Lyoto Machida’s performances in the UFC. As I’m sure you know, Machida has a strong background in Shotokan karate and hence I have heard quite a few Shotokan practitioners saying that this proves karate’s effectiveness. But does it? Machida has not made the first mistake as he has differentiated between environments and trains specifically for the MMA environment. Not only that, he has also not made the second mistake as his “success criteria” is effectiveness in MMA. His training is therefore perfectly set up to address the needs of MMA combat. The Shotokan practitioner – or any other form of karateka for that matter – who trains twice a week in sessions that consist of nothing more that 30 minutes of line work, 30 minutes of solo kata and then 30 minutes of light sparring (that does not allow low kicks, hooks punches, grabbing, grappling, ground-work, heavy contact, etc.) cannot compare what they do with what Machida does. They are entirely different. Machida’s success does therefore not prove that all Shotokan practitioners will be UFC champions, nor does it prove the effectiveness of line work and air punching in preparing MMA fighters. Personal training can only be judged by personal results. You can’t say Machida’s success has any bearing on your own training. You are as good as you are … you are not as good as Machida just because you both label what you do as “Shotokan”. I’ve also heard people make similar claims about Gavin Mulholland and his students. Their success in the cage does not prove the effectiveness of karate overall in MMA, it just proves the effectiveness of the way Gavin trains his guys for MMA (which is a just one part of their overall approach to karate). Again, you’ll notice how mistakes 1 and 2 are not made. The other thing I often come across is my thinking and viewpoints being used as proof that kata is effective … by people who train in an entirely different fashion! 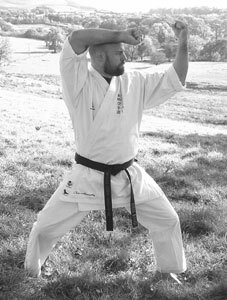 As I’m sure you know I am a great believer in kata and I feel it does have a massive amount to offer the practically minded karateka. But it has to be approached in the right way. Endless solo kata with the sole purpose of making it look good so you can win competitions or pass gradings (see mistake 2: this is another example of artificial success criteria at work) will not lead to combative effectiveness. Studying the bunkai and giving the methods contained within kata free range in sparring will lead to combative effectiveness though. There is an ever growing number of karateka who are returning to a holistic and pragmatic approach to karate. I meet these people all the time and what they do is very effective. I would imagine that many of the people reading this fall into the category of those pursuing effectiveness. However, karateka who don’t study bunkai, and who don’t use that knowledge in their training, should not use the effectiveness of those who do to justify what they do. The reason for this is that although both groups operate under the name of “karate” they are not training in the same way. I also frequently see people in karate pointing to the exceptionally talented (the exceptions to the rule if you will) to justify practises that are inappropriate for the majority and they themselves. This is another example of failing to judge personal training by personal results. For example, when I have said that head-height kicking is not a wise idea in real situations, it is not uncommon for people to point to people like Terry O’Neil. Terry O’Neil in an amazingly talented karateka and it’s true that he has used head height kicks effectively in real situations. However, can you kick as well as Terry O’Neil? If not, I would suggest you keep the kicks low if you kick at all. Today’s elite and yesterday’s masters can’t fight your battles for you. It’s what you can do personally that counts. Don’t base your training on the exceptional abilities of others; base your training on what it will do for you personally. And likewise, don’t fall into the trap of claiming the positive benefits of other approaches for yourself when you train differently. It’s not about claiming the ability of exceptional individuals as your own, and it’s also not about claiming ability through a shared label of “karate”. You should only judge the effectiveness of your personal training by what it has done for you personally. To solve this, be 100% sure what you are training for at any given moment and be sure that all training is 100% relevant to that environment. No trying to cram everything into the generic “karate” box. Understand that modern karate has many subcomponents and that these subcomponents need to be trained individually if confusion is to be avoided and effectiveness attained. No over emphasising the “cross-overs” and the “by-products”. Keep all training 100% focused and 100% relevant to whatever you are training for at any given instance. Always measure the value of a technique or training methods by the results it yields. Don’t judge things by artificial success criteria such as how something looks or “style purity”. Measuring by effect and relentlessly working to enhance that effect should be what the martial arts are all about. The only way to achieve effectiveness is to specifically train for effectiveness. Training for another artificial goal, or no goal at all, and hoping we will become effective by default, is not going to lead to effectiveness. 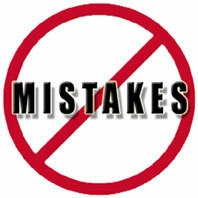 Inextricably linked to the previous two mistakes is the need to judge personal training by personal results. How do you train and is that working for you? It’s not about claiming effectiveness from the way others train or the exceptional abilities of exceptional individuals. It’s all about whether your training is working for you. Other people’s ability means nothing because you are not them. And other people’s training regimens mean nothing to you if you are training differently. It may well be the case that your training does not fall foul of these mistakes. After all, you obviously have an interest in pragmatic karate … as is evidenced by the fact you have read this far. However, it’s always a good idea to check just in case you are one of the people who does not realise they are making these mistakes. If you are clear on what environment you are training for, and you know what it takes to be successful in that environment, and you always measure your personal skills by the effect you can personally attain, then you are sure to develop high levels of skill and martial efficiency. Your karate, and hence karate generally, will thrive when you steer clear of these common mistakes.